Our souls are entwined, my horses' and mine. Breathing in the smell of a horse sets my whole world right. Just experiencing them is my biggest passion. Next to that comes barefoot trimming and all the benefits it brings to them. Helping them heal and blossom into the horses that we all dream of having, bright eyed, energetic, playful and trusting companions is like nothing I've ever done before. Folks other than me with a better knack for the right words to convey what a wonderful gift it is allowing your horse to have back the feet they were born with have wonderful sites up. I'll give you some of my favorite links. Our horses give us so much, how can we not give them back our very best? A little red dun horse with flat underslung feet started me on this barefoot quest. Four years later, with much trial and error and soul searching, she is a happy horse. 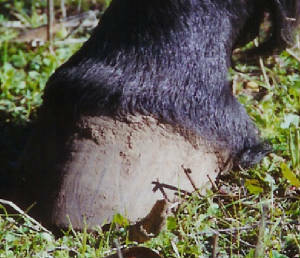 About six years ago I was fortunate enough to be able to take Martha Olivo's Hoof Groom Course. Armed with new knowledge, skill and resolve I finally began to make progress in correcting her hoof form instead of just making her more comfortable. We have a dozen or so other horses and they all came to have good sound barehooves quickly and easily. I'll always keep a special place in my heart for my little "Sweetpea" for causing me to learn enough to get really competent at this trim. Many trimmers have become proficient enough to be able to give clinics year round at many different locations. If you have the desire to learn, some hands on instruction will ease and speed your way. I put a rasp in the capable hands of Linda Cowles and she hasn't looked back since. With her first lesson from me I knew she was going to be great and really make a difference in the trimming world. I highly reccomend her site not only for trim info but also for links to other sites and to competent trimmers. Her energy is boundless and her knowledge base grows daily. If you want to get a feel for what moves us barefooters to do this, check this out!! You may have to wait a bit or maybe even hit your refresh a few times to get all the photos to come up, but it is well worth the effort. When you are done with the wild horses, check out Pete Ramey's site in general, it's a very good one. I believe that one of the best things I can do for the horses in our world is to help other owners become aware of the benefits of having barefoot horses. I am always happy to help anyway I can with information, finding contacts or local trimmers, or whatever help and advice I can personally contribute. If you email me just reference barefoot. 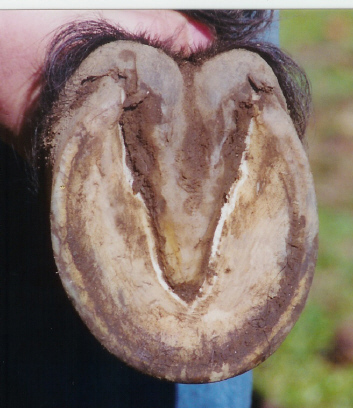 If you are interested in knowing more about how to give your horse rock crushing bare hooves, check out these other outstanding sites.